Users of Messenger+ have access to additional features that make managing a Textlocal account easier, and simpler. Messenger+ has all the rules and procedures in place to safely and effectively manage your Textlocal account for your business. 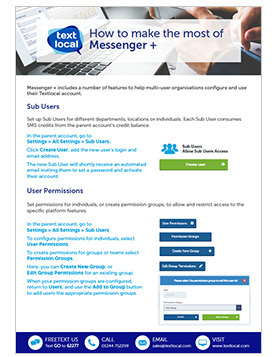 Creating Sub Users by department, location or as individuals allow multiple users to use your Textlocal account at one time. User Permissions can be set to restrict access to certain areas of the platform by department, groups or individuals. Lockable Templates ensure that only certain aspects of a message template can be edited, and only approved content can be sent. Send Approval allows a moderator on the account to approve content before it is sent out. Rest assured that a second pair of eyes will check for misspellings or incorrect URLs to prevent them being sent out. More more information download our Messenger+ guide.